Diabetes, a chronic condition that results in excessive sugar in the blood, has always been associated with genetic and lifestyle factors such as obesity, lack of exercise etc. But recently, studies have shown that even air pollution can be a cause for diabetes. In the year 2016, a new study was conducted to show that even at a level considered safe, air pollution is a cause for diabetes in one out of seven people. Earlier studies have suggested a link between pollution and diabetes but this study published in the Lancet Planetary Health is significant as it quantifies the burden. It gives an estimated figure of 3.2 million new diabetes cases (14 pc of the total) affected globally in 2016. According to the World Health Organisation (WHO), a person can be diagnosed with diabetes despite following a healthy lifestyle due to air pollution. What is worrying is that 14 out of the 20 most polluted cities in the world are in India. Pollution triggers inflammation which reduces the body’s insulin production, according to a US-based research. 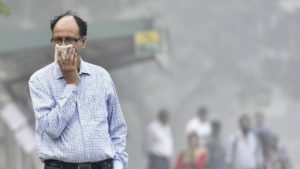 India being a more polluted country compared to other countries in the West, there is a high chance of the risk among Indians. The Indian Council of Medical Research (ICMR) found that prevalence had increased by 64 pc in the past 25 years. The Lancet study examined data from 1.7 million US veterans who did not have histories of diabetes and were followed for a median of 8.5 years. Patient information from the veterans was compared to air quality information in order to examine the relationship between pollution and diabetes risk. And, it was found that the risk of developing diabetes exhibited a strong link to air pollution. Mumbai-based endocrinologist Dr Shashank Joshi said pollutants such as suspended particulate matter PM 2.5 contain endocrine-disrupting chemicals. “A recent ICMR-INTAB study has shown the increasing rate of diabetes across north Indian cities that have a higher rate of pollution,” he added. Dr Joshi contradicts the Lancet study’s hypothesis to some extent that reducing pollution would reduce the chances of diabetes. According to him, “Scandinavian countries have the cleanest air and the best environmental laws and while they do not have diabetes type 2, they have a high incidence of type 1 diabetes and other autoimmune conditions. Cleanliness has its own set of problems,” he said. Diabetes, which is one of the fastest growing diseases affects around 420 million people globally.